On Saturday I had the opportunity to be a tourist in my own city by joining the Edmonton Food Tours 104 Street Feast tour led by the fabulous Liane Faulder, food writer for the Edmonton Journal. The Spaniard and I met up with Liane at Kitchen By Brad, a downtown culinary studio open for cooking classes and private events on 105th street, to kick off our tour with brunch served up by Chef Tracy Zizek. We were joined by Jayne of Girl Tweets World, a full-time travel blogger, who was in town to courtesy of Travel Alberta. Chef Zizek treated us to a menu of Ukrainian dishes including handmade perogies, coleslaw, pork meatballs slathered in mushroom gravy, house-made Irvings Farm Alberta Pork sausage, and two kinds of pickled beets. Tracy also demonstrated how they make Nalesniki, a crepe filled with cottage cheese. The Spaniard happily accepting a second helping of meatballs. As a second-generation Canadian with Ukrainian heritage, it was a comfort food menu I have eaten on many occasions. Sadly, since getting diagnosed with Celiac disease seven years ago, I haven’t had Nalesniki, Tracy graciously had a serving for me. I also couldn’t eat the meatballs but did get a cup of mushroom gravy I ate with a spoon (it’s like Tracy has a key to my stomach). There was an assortment of condiments on the table and I easily finished the jar of pickled golden beets. After finishing a glass of Tracy’s Saskatoon lemonade, we were off to the City Market Downtown on 104 st. Living in Oliver, the City Market is the market we frequent most often in the summer. I thought I knew a lot of the vendors and would be joining the tour as a know-it-all, but I have to say I thoroughly enjoyed the tour and learned so much on our three-hour adventure. We had a chance to sample yellow-grape tomatoes from Gull Valley Greenhouses, pick out a treat as well as a chocolate bar at Jacek Chocolates, and received a goodie bag of cookies from Confetti Sweets, whose baked goods were featured at the Oscars not once but twice. We regularly buy fish from Ocean Odyssey Inland, but the tour gave us an opportunity to learn more about the sustainability of the products that they sell. With the $10 each in market bucks we received as part of the tour, we came back to buy some pacific rockfish and Icelandic redfish. We visited Ray Ma, co-creator of Honest Dumplings, a line of Chinese-inspired dumplings featuring high-quality, often local and organic ingredients. Originally from Shanghai, Ma and her husband Chris Lerohl saw an opportunity in Edmonton. Unfortunately this gluten-free girl can’t indulge in them, but if I could, I’m sure the maple pork belly would be my favourite. Two vendors I really enjoyed stopping at and learning more about was Reclaim Urban Farm and Fruits of Sherbrooke. The former reclaims back and front yards, empty lots, and gardens in the neighbourhoods of Garneau, Old Strathcona, King Edward Park, and Bonnie Doon, repurposing them to grow food. Fruits of Sherbrooke is a not-for-profit society armed with volunteers who rescue fruit and turn it into 30 different types of jams, jellies, sauces and condiments. In addition to selling their wares at the market, Fruits of Sherbrooke shares their products with snack programs in high needs schools in the city, to community programs sponsored by the University of Alberta, and to our local Food Bank and were used at summer camps for new Canadians. They also teach jam classes! We also stopped by Meat St Pies where I had my first-ever slice of Meat St Pies gluten-free veggie pie, which was made with a spaghetti squash crust. No stop to the City Market is complete without an Irvings Farm bacon pick up from Alan. Our last stop of the day was another first for me – DeVine Wines & Spirits on the corner of 104st and Jasper Ave. The Spaniard was very impressed with the size of their Spanish collection, and we got to sample two wines worthy of a Thanksgiving dinner pairing. I walked out with a bottle of Lambrusco I am very excited to try – a great takeaway from the tour. I walked away with a full belly, an I love yegdt bag filled with samples and goodies, and a wealth of information on vendors I walk past almost every week. 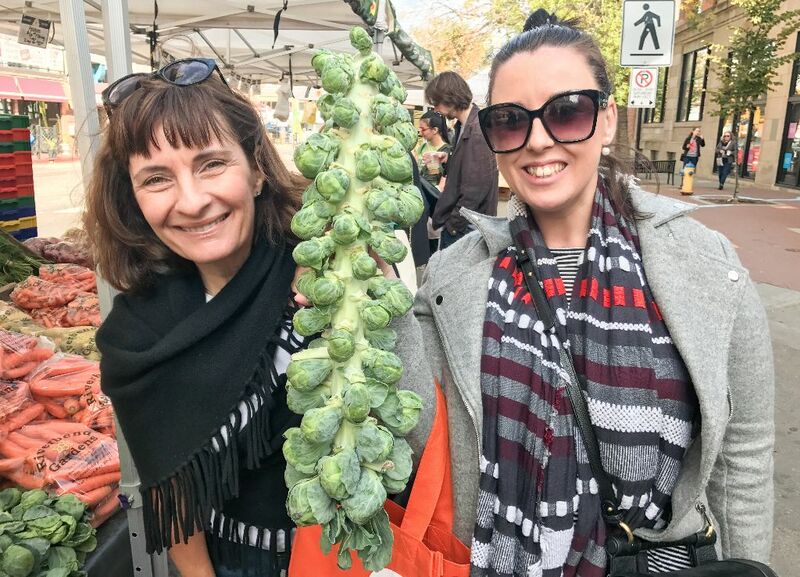 Even if you already shop at the City or Strathcona Farmers Market, I would absolutely recommend the opportunity to be a tourist in your own city, and experience one of Edmonton Food Tours culinary experiences.